Heat oven to 350°F. 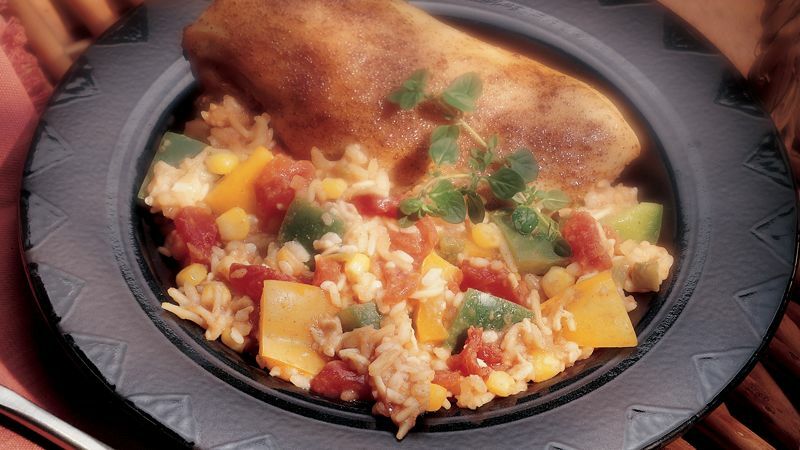 In ungreased 3-quart casserole, mix bell peppers, corn, rice mix with seasonings, water and tomatoes. Sprinkle blackened seasoning over chicken; place chicken on rice mixture in casserole. Cover; bake 40 to 45 minutes or until rice is tender and juice of chicken is clear when thickest part is cut to bone (170°F). If you prefer, you can use boneless skinless chicken breasts instead of the bone-in. Decrease the baking time to about 20 minutes.